Cozmodentist provides best root canal treatment in Noida. Comodentist is advanced dental hospital located in Noida and its Chief doctor is Dr Pavan. 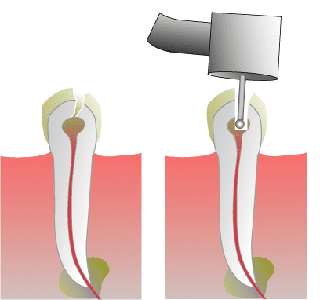 Root Canal treatment in used to treat damaged pulp of a tooth.In this process, Damaged pulp is removed and vaccum is filled and sealed. After complete cleaning of tooth, root canal is closed. What is pulp? Pulp, a soft substance, is located in center of tooth. It contain connective tissue, nerve and blood vessel. Poor oral hygiene is main reason for all dental problems. Due to poor hygiene, cavity is formed. If this cavities untreated, after some time pulp will be affected and lead to ranal canal problem. Root canal is not quite expensive treatment. Dentist's charges depends on number of root canal to be treated, number of sessions and difficulty of treatment.